PCS Extended Meeting Schedule - An app I wrote for my computer club's members to look up all currently scheduled meetings. Tantrum Tracker - An app I wrote to record a child's behavior and encourage him or her to work towards an agreed-upon goal. Can also be used to reward your partner when he or she completes those mundane household chores. Every graphic on this page reflects samples of work that I have done for my clients as well as myself. I have either revised an existing graphic or designed one from scratch, depending on the particular situation. Here's a closer look at some of the more interesting ones. 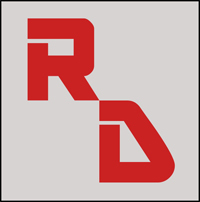 This "RD" logo is actually the original artwork for the "favicon" which you will see in your browser's window tab or in the address bar. A favicon is a very small version of your logo that helps personalize your site and also appears in your Favorites or Bookmarks. They're difficult to work with because of the tiny scale available (usually only 16 x 16 pixels) and therefore it's very easy to lose detail in the finished product. The best way to create one is to make a larger image in Photoshop and then have it down-sized online. I use DynamicDrive which does the conversion at no charge. 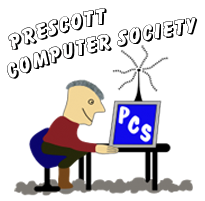 This is the full-size graphic I designed for the Prescott Computer Society Messenger, a monthly hard-copy and PDF newsletter. This is a winter scene of Thumb Butte, one of our local landmarks in Prescott, Arizona. This is the full-size graphic with transparency that I created for a local computer consulting firm. I worked from the client's original design and revised it as required. In this case, I also added some royalty-free clip art from Open Clipart Library. A full-size graphic with shadows and transparency that I designed for our local computer club. Here's a fun one I created after a re-design of an existing graphic from our computer club.